PENSRUS, one of the top U.S. BIC pen distributors, compiled a handy 1-page guide to help those looking for engraved or imprinted pens find just the right pen for their needs. This BIC Buyer’s Guide is available at no charge on the PENSRUS site and summarizes in an easy to read table the different features and characteristics of the most popular BIC pens. We hope our new BIC Pen Buyer’s Guide will ease the decision making process, and simplify and clarify the differences among the many BIC writing instrument choices. The extensive lineup of BIC pens is responsible for more promotional pen purchases than any other maker of ball point, gel, highlighters, pencils and roller ball pens. Chances are, the next time you’ll encounter a personalized pen at a trade show, conference, wedding or reunion it will be one of the many BIC style custom pens available. In fact, there are so many different models of BIC pens – retractable click, stick, twist and more – that sometimes selecting the right promotional pen can be a little daunting. Recognizing the need to simplify the buying process, PENSRUS, one of the top U.S. BIC pen distributors, compiled a handy 1-page guide to help those looking for engraved or imprinted pens find just the right pen for their needs. This BIC Buyer’s Guide is available at no charge on the PENSRUS site and summarizes in an easy to read table the different features and characteristics of the most popular BIC pens. Listed in order of popularity, the handy table in this guide includes the following information on BIC custom pens: Type of pen, imprint area size, number of colors available for both the barrel and trim or cap, type of ballpoint available, minimum pricing, minimum order quantity and more. 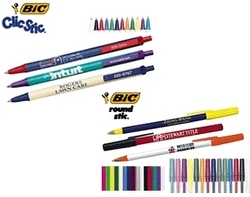 And for those wondering which BIC pens sell the most, here is a listing of the top 4 sellers at PENSRUS: BIC Clic Stic, BIC Round Stic, BIC Tri Stic, and the BIC Grip Roller. PENSRUS is a world-leader in the advertiser specialty industry providing a huge assortment of personalized and promotional products including personalized pens, pencils, sticky notes, mouse pads and more. Founded in 2001 PENSRUS has helped thousands of companies increase customer loyalty and brand reach through their quality products.